When we got our kitten, we had first seen a few pictures of him at the breeder's house. He had a mischievous look about him. Also, my husband and I are rather down-to-earth people, and an exotic name just wasn't on our radar. We remembered the very old cartoon about the boy, Buster Brown, who continually got into scrapes. We predicted our kitten would be robust, inquisitive, and happily obnoxious. So, we named him Buster Brown. He is two years old now, and his personality is exactly as we thought. We love our Buster Brown! Buster! I love it. 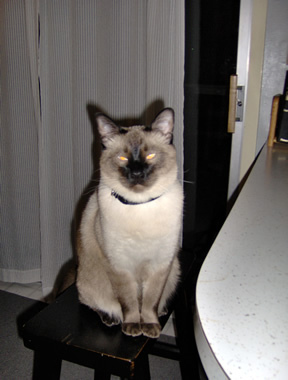 Yes, our Siamese cats are generally all those things, aren't they - mischievous, inquisitive, always investigating something or other and getting themselves into trouble. Buster looks very well-behaved waiting for his dinner, though!